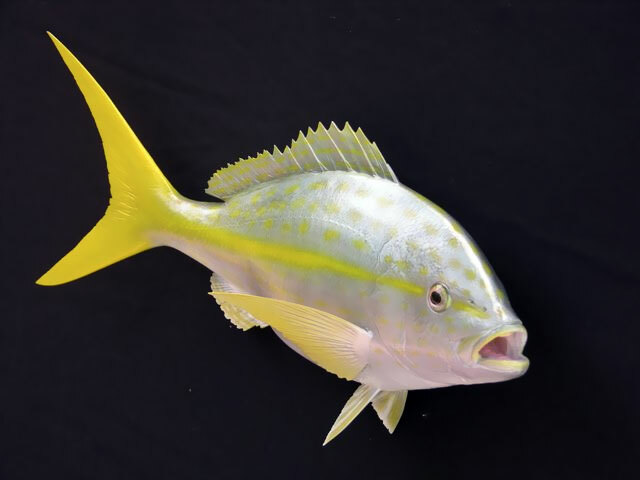 The yellowtail snapper, Ocyurus chrysurus, is an abundant species of snapper native to the eastern Atlantic Ocean including the Gulf of Mexico and the Caribbean Sea. Although they have been found as far north as Massachusetts, their normal range is along Florida south to the West Indies and Brazil. This species is mostly found around coral reefs, but may be found in other habitats. They occur at depths of from near the surface to 180 metres (590 ft), though mostly between 10 and 70 m (33 and 230 ft). This species can reach a length of 86.3 cm (34.0 in), though most do not exceed 40 cm (16 in). The greatest weight recorded for this species is 4.1 kg (9.0 lb). It is a commercially important species and has been farmed. It is sought as a game fish by recreational anglers and is a popular species for display in public aquaria. This species is the only known member of its genus. 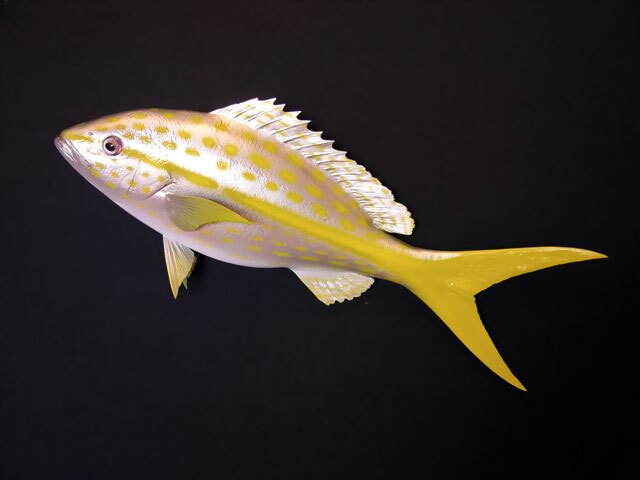 In certain reefs, most notably in the Florida Keys, this beautifully colored fish is commonly spotted among divers and snorkelers. Yellowtails feed on shrimp, crabs, worms, and smaller fish. They spawn in groups off the edges of reefs from spring to fall, but heavily in midsummer. Yellowtail snapper are typically caught in 30–120 ft of water on and around reefs and other structure. The most common method of catching them is with hook and line, and the use of frozen chum, typically leftover ground fish parts, to attract the fish. The chum is placed into a mesh bag or metal basket in the water, and as the chum slowly melts, small pieces of fish drift out and down towards the bottom, where the yellowtails typically feed. The chum keeps them near the boat for extended periods of time, as well. Light tackle is the generally accepted means of catching yellowtail snapper. Typically, the fish are relatively wary of higher-test or thicker line, and larger hooks. Most fish caught by anglers range from eight to 14 in, although catches to 16 in are not uncommon. Yellowtail snapper can be caught on a variety of baits, including both live and frozen shrimp, squid, and a variety of live and frozen minnows or smaller baitfish. 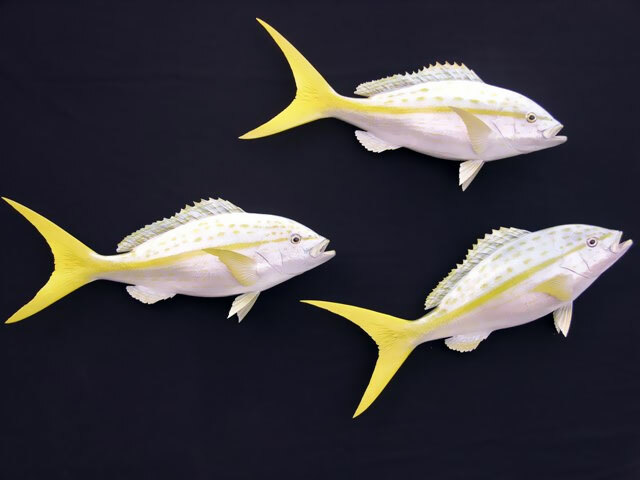 Yellowtail tend to be wary fish, and the appearance of larger predators, such as dolphins or sharks, can scare off schools until the predator leaves the area. Most anglers pursue yellowtail snapper during the warmer months, but they can be caught throughout the year. Yellowtail snapper is highly prized for its light, flaky meat and is considered by some to be one of the best of the snapper family.